Apple presentation app needs to be developed further along than this. Keynote for iOS has always been designed around interaction more than its macOS counterpart, partly because it’s more likely you’ll be using a single screen to present than multiple monitors. That shows clearly in this minor update. And many of the new features bring Keynote for iOS into feature parity with its macOS counterpart, as well as a consistent interface and set of options alongside Pages and Numbers on both platforms. Just as you can in the other iWork iOS apps (Pages and Numbers), Apple Pencil or your finger can be used to create drawings on iPads with Pencil support. This a useful improvement for Keynote—making as much sense here as in Pages—with the added benefit that Keynote for iOS can animate the drawings you create by effectively replaying them. The animated drawing feature is, unfortunately, rudimentary and needs more development. It shows stroke by stroke the gestures you made, and you can play back those gestures by creating a build for the drawing and then selecting the Line Draw option. You can set an overall duration for the drawing to occur, but you can’t remove strokes, control the speed of a stroke, rearrange them, or modify them. If you use the eraser to remove part of a drawing, that piece is removed from all the frames, making initial drawing stages look peculiar. You have to be perfect in your original drawing for this feature to work, which is asking a lot. 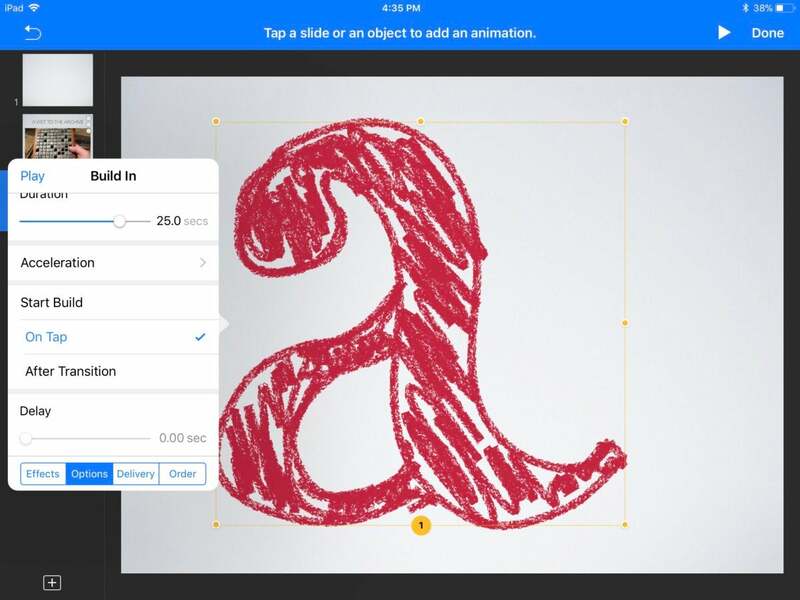 You can both draw in Keynote and animate the drawing, using a special build that replays your work stroke by stroke. As in Pages and Numbers, Apple peculiarly relies on a subset of standard markup toolkit for creating drawings, which feels inadequate relative to even some of the simpler standalone drawing apps. Apple shouldn't put a full sketching environment into these apps, but I’m not sure this is robust enough to let people add additional value into their presentations. The company also opted to not support pressure sensitivity with Pencil, which feels like an odd choice. Instead, you have to double-tap a drawing tool to select thickness. This seems to disable one of the Pencil and iPad Pro’s combined flagship features without offering a benefit. Keynote’s other main new feature is an image gallery, which functions as a reasonably useful slide show. You add the image gallery, select images, and then can add captions (or use a single caption for the entire show). The slideshow can have one of three transitions: Appears, Dissolve, or Move In. However, unlike the new Keynote for macOS, it doesn’t appear as if you can set a duration between slides for automatic playback, making the feature slightly pointless. 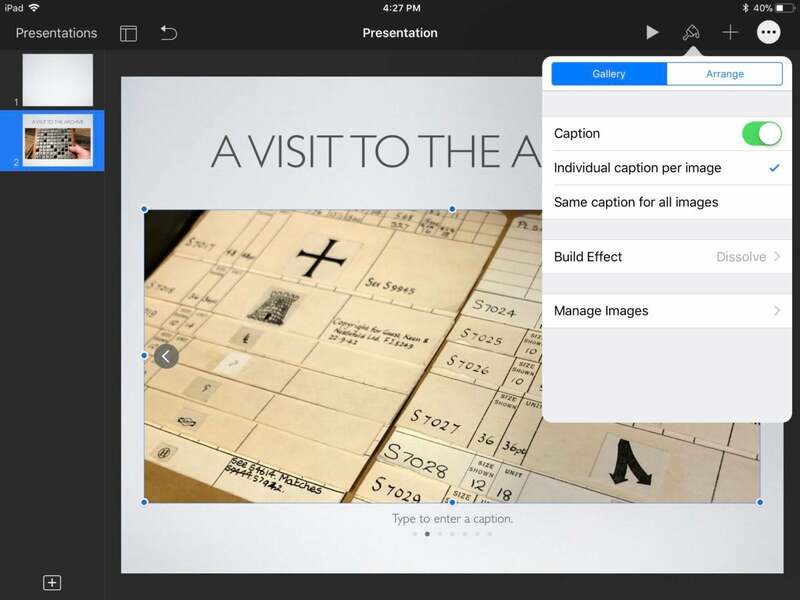 The image gallery feature lets you create a slideshow, but the iOS release of Keynote can’t automatically advance it. For feature parity, Apple now lets you change themes in Keynote for iOS, and adjust the slide size and aspect ratio of presentations. Previously, you would have had to roundtrip the presentation to a Mac and back to iOS to make those modifications. Keynote now offers donut charts, which may make your stomach rumble, but apparently were one of the few common chart options missing. As with all the updates to apps, there are new shapes of all sorts you can insert and then edit to customize. Support for real-time collaborative editing for Keynote files shared via the Box document service is now included here as in all the productivity apps on both platforms. And I found one consistent showstopper, just as with Pages for iOS: whenever I attempted to use the All Photos album to add media, Keynote froze and eventually crashed. I use iCloud Photo Library and have over 37,000 media types in it. Whatever the quantity, this kind of flaw shouldn’t happen with released software from Apple. Unlike the similar Pages flaw, changes made up to the moment of using the image selector were retained. Keynote 4 for iOS lacks the polish I’d expect from a release version, especially with effectively no changes unique to the app, but all incorporating options are available across apps and between platforms. Apple needs to give more attention to Keynote, fix the missing image gallery features that it already added to the Mac version, and provide more general polish. It also needs to push Keynote forward with better and richer interactivity, something that should be expected this many years into its development. Apple hasn’t advanced Keynote for iOS in a while, but this release brings it into parity and compatibility with Pages, Numbers, and macOS.